The average American can expect to live 79 years… and 70 of those years are spent indoors. We breathe an average of 17 kilograms of air per day, far more than the few kilograms per day of food and water that we ingest. From the perspective of human health, it is critical to understand indoor air quality. From the perspective of fundamental science, it is fascinating to explore the factors that govern the airborne chemical environment in which we spend most of our time living and breathing. Historically, air pollution research has been focused outdoors. 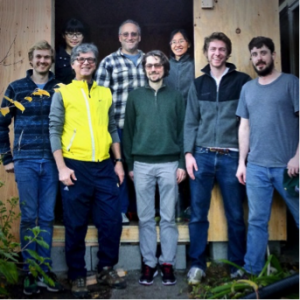 The Goldstein Lab has spent the past few decades developing cutting edge scientific instruments and answering seminal questions about outdoor atmospheric chemistry and outdoor air pollution. Through the Alfred P. Sloan Foundation Chemistry of Indoor Environments program, we are now bringing that expertise indoors to explore the spaces we live in. What air pollutants are present indoors? What are their sources? How are these chemicals transformed over time and what factors control those changes? Broadly, our research efforts emphasize field campaigns and laboratory studies. We focus our analytical measurements on organic chemicals in indoor environments, ranging from volatile organic compounds (VOCs) to semivolatile organic compounds (SVOCs), the latter present in both gas and particle phases. A variety of sources emit organic chemicals indoors. Many building materials and contents continuously release volatile and semivolatile components to the indoor air. Organisms indoors — including people, plants, animals, and microbes — can also emit organic chemicals as metabolic byproducts. 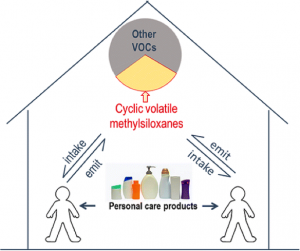 Organic chemicals emissions can originate from human activities, such as personal care product use (e.g., cyclic siloxanes commonly found in antiperspirants), cleaning product use, cooking, and other activities. Some organic chemicals can be transported from outdoors or from coupled spaces such as the attic, basement, or crawlspace in a house. Many chemicals pose known or suspected health concerns: formaldehyde, flame retardants, plasticizers, pesticides, and combustion byproducts are all common organic compounds or chemical classes that can be found indoors. In addition, indoor chemical reactions in the gas phase or on surfaces may transform VOCs and SVOCs, influencing chemical fates and occupant exposures. We seek to characterize and quantify VOCs and SVOCs indoors and to understand the dynamic processes that influence their concentrations. Do these indoor chemicals originate from outdoor air, human activity, microbial activity, or from building materials? How do these chemical species change in a dynamic indoor environment, where temperature, humidity, and air exchange with outdoors can rapidly change? What chemical reactions occur in the indoor air and what are the dominant reactants (including oxidants like O3, OH, or NO3)? How do the organic compounds interact with surfaces, which can act as catalysts to accelerate certain chemical reactions or as a sink wherein chemicals accumulate? Our research methods and selected findings are discussed below. Fig 1: Direct contributions of humans to the indoor environment (from Tang et al., 2015). volatile organic chemicals in a heavily occupied classroom. We applied a modern analytical instrument (proton-transfer reaction time-of-flight mass spectrometry, or PTR-ToF-MS), which is able to quantify numerous VOC concentrations in real time with excellent specificity and sensitivity. Strikingly, we found that the students themselves were the main source of VOCs measured in this indoor environment. Among other chemicals, students emitted large quantities of volatile cyclic siloxanes, which are commonly incorporated into personal care products. Large spikes in certain VOC concentrations were also observed with certain activities, such as monoterpenes from eating citrus. Fig. 2: SV-TAG chromatograms comparing outdoor, indoor background when no events are occurring, and indoor during a cooking event at H2. Campaigns: Residences H1 and H2. Indoor environments are complex and dynamically changing. So are the sources and emissions of organic compounds. Most previous studies have either done short-term grab sampling, or have determined time-averaged concentrations of VOCs and SVOCs on long timescales (hours to months). Such approaches do not provide in-situ continuous or space-resolved measurements needed to characterize dynamic processes. In the H1 and H2 field campaigns, we characterized time-resolved VOC concentrations by PTR-ToF-MS at multiple locations in regularly occupied residences. This investigation represents the first time that such monitoring has been undertaken in residences under normal occupancy. By collecting extensive metadata, including experimentally determining the air-exchange rates using tracer gases, we determined emission rates of hundreds of VOCs at high time resolution, traced the locations / activities associated with those emissions, and examined the role of environmental parameters on emissions. Additionally, we measured the NO3 radical for the first time indoors during the H1 campaign. In the H2 campaign, we added measurements to characterize SVOC concentrations in the gas and particle phase. 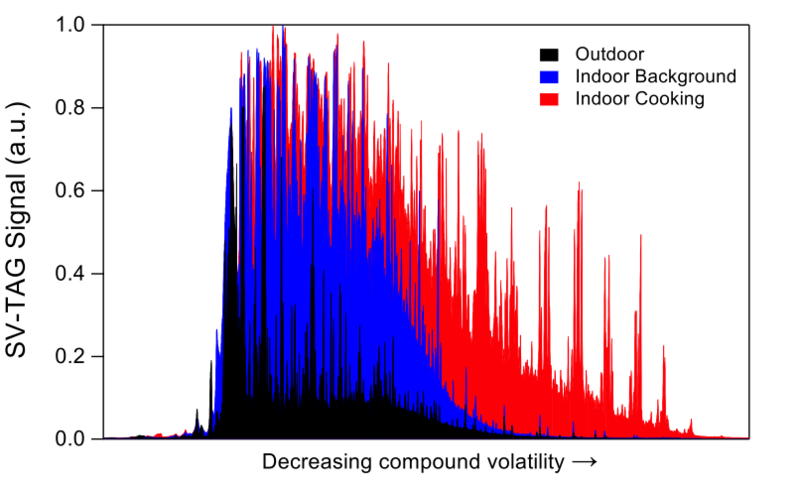 Utilizing semivolatile thermal desorption aerosol gas chromatography (SV-TAG), we have acquired the first time-resolved dataset providing hourly SVOC measurements indoors in a residence during normal occupancy.We demonstrated that SVOC concentrations in indoor air are markedly higher than those outdoors and that the dynamic behaviors of indoor SVOCs are strongly influenced by temperature with episodic enhancements related to cooking and cleaning. From ongoing analysis of the H1 and H2 field campaign data, we aim to answer important questions about the chemical and physical transformations of VOCs and SVOCs and their implications for human exposure. Campaign: HOMEChem. We are excited to work in unison with 19 other research groups in Austin, Texas. More information can be found here. Laboratory Studies: Squalene Oxidation. Squalene is a major ingredient of human skin oils that can rapidly react with ozone. We characterized squalene degradation by ozone in a series of flow tube reactor experiments in collaboration with Dr. Kevin Wilson at Lawrence Berkeley Laboratory. We measured squalene degradation products by PTR-ToF-MS and characterized the effects of humidity on degradation reaction pathways. Fig 3. The research team at H2.